I tell you what...when I started out the #TuesdayTen partnership with Lisa I didn't realize how much I would learn and grow from it. I've been tricked into organizing my purse, fooled into cleaning out my van, and now I've had to go and get all introspective. Today is National Rubber Eraser Day. I'm sure it's not a coincidence that it's also the day Income Taxes are due. I mean, who doesn't mess up when trying to get taxes done! In honor of the holiday, we are listing 10 mistakes we've made and what we've learned from them. Before I post my list, I would like to say that I have very few regrets. All of the mistakes I've made have led me to where I am now. I think every one of the items on this list was a chance for growth, even if it was a mistake I wish I hadn't made. Buying this house-Back in 2003, mortgage rates were quite low and I was pregnant with our first child. Everything around me was screaming that NOW WAS THE TIME TO BUY A HOUSE!! I feel like I rushed into it because I was following some made up time line in my head. In retrospect I wish we had waited longer and not settled on a house that was good enough, just so we could own a home. I'm not saying I hate our house or anything, but my blinders didn't allow me to see far enough into the future to know how quickly we'd run out of space here. My engagement-Wait!! I'm not saying that getting engaged to Ken was a mistake. This is another time in my life where a made up time table stressed me out and I didn't allow things to happen as they should have. On our five-year dating anniversary, I had the thought in my head that THAT DAY would be the perfect day for him to propose. I was so set on that being the day, that I got upset at each minute that went by that he wasn't proposing. He ended up proposing to me that evening as I was pouting on the couch. Later he said that he had thought about it quite a few times earlier in the day, but I seemed like I was in a really bad mood and he was put off by that. Looking back I wish I had been more patient and just allowed that day to pass as a normal day. "Just this once"-This is a rookie parenting mistake. There have been a few times that I have allowed something "just this once" that I never should have allowed in the first place. My kids have memories longer than an elephant's! Now they bug me to let them do something that I allowed once in the past, against my better judgment. Bleaching whites-This one seems stupid, but as I was thinking on learning from my mistakes it popped into my head. Our washer has a place where you can add bleach and it will come out at the proper time during the wash cycle. I hadn't used it much, but recently when I was washing a load of dingy whites, I thought I'd give it a try. I ended up bleaching a few things that shouldn't have gotten bleached, including the insignia on one of Ken's work shirts. I've since learned to sort more carefully. Not asking for help when I need it-When I was a younger mother, I took a lot of pride in being able to do things on my own. I very rarely asked for help with anything, and I often refused it when it was offered. Then someone made a statement in my presence (not directed at me or anyone in particular) that by not allowing others to help us, we are denying them the joy of service. Since then I've tried to be more gracious about letting people help me, whether it be taking my cart back to the grocery store, washing my laundry when our washer was broken, or accepting things from others when we can't do for ourselves. Saying I don't like cleaning-Once when I was cajoling Frances into doing some chores with me, I mentioned that I didn't like doing chores either, but I did them because they needed to be done. She brings up that statement almost every time we try to get chores done. It's now a permanent fixture in her whine catalog and I hate having my words thrown back at me constantly. Forgetting that my kids are just kids-Messes, fights, pre-dawn wake-up calls, forgotten items, lost homework...the list goes on. All these things make me upset and I start to get into nag mode. I forget that all of these things are part of childhood. My kids aren't bad kids when these things happen. They are regular kids And the most important thing is how I deal with the transgressions. Holding on to things I should let go of-I overheard someone say something about me once and I haven't forgotten it. I guess part of the reason it upsets me is that it's true. That doesn't mean I liked hearing it though, and I have had trouble forgiving this person for thinking something about me that I've thought about myself. In writing it out, it seems even more ridiculous than before. Not wearing other people's shoes-Part of this goes along with the item above, but it also goes beyond that. I have made the mistake, many times in the past, of not letting myself see things from another's perspective. A silly example would be getting upset when people don't send me birthday cards, while also forgetting that I rarely send them out myself. It's a hypocritical view point to have, and each time I re-realize it, I ponder it a bit more. Not learning from my mistakes-Hmmmm...This is a meta-list now isn't it! A list about learning from my mistakes that includes the issue of not learning from my mistakes! Kinda makes my head spin a bit! The most relevant thing I think of here is the fact that I am writing this on Monday evening at the last possible moment, even though I've known about this prompt for at least 2 months. Some day I'll learn from my mistakes...but not today! LOL! What mistakes have you learned from? Link up your own post or tell me in the comments. 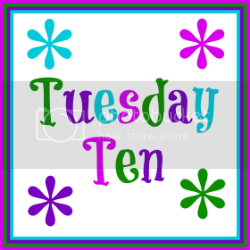 5) By linking up you agree to be subscribed to out #TuesdayTen mailing list. Emails are only sent once a week and you can unsubscribe at any time. If you would like to be added to the mailing list without linking up, click here.Come link up again next Tuesday, April 22, when the topic will be 10 Favorite Candies (in honor of National Jelly Bean Day)!